This is seriously the most wacky I've found yet! We've been having such a laugh here in the office today about this book. One of my reps went to see a customer and this was one of the books on the table out the front. The second I saw it I burst out laughing and we've spent the day coming up with puns and stupid marketing and tie-in promotions we could do with this book and one we have coming in April, called Journey of Hope: Quilts Inspired by President Barack Obama (another, in my opinion, wacky book!). Are you excited yet? I know I am. If you hurry Booktopia has them on sale for a crazy $10.35! How could you resist at that price?!?!? For the many who can't get enough of this remarkable team, here's a book featuring the Obamas:--on vacation in Hawaii-golfing at Camp David-on election night-at the extraordinary inauguration and inaugural balls-travelling the world on foreign affairs trips-rolling up their sleeves for a day of service-plus much more! Highlighting Barack's uniquely professional, yet down-to-earth wardrobe that reflects his popular persona and Michelle's outstanding taste in fashion, this book is a must for anyone wanting that special 'yes we can' kind of day, every day. I just love that final line - "...this book is a must for anyone wanting that special 'yes we can' kind of day, every day.". Classic! What the hell is a 'yes we can' kind of day supposed to be like anyway? Haha - love it! 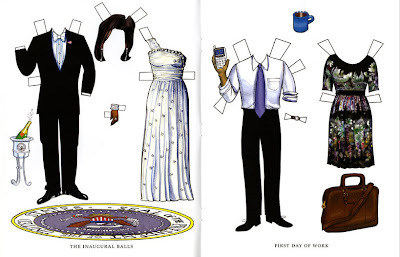 I have a wedding paper dolls book which I thought was pretty tacky, but this definitely takes the cake! the doodle book is actually fascinating (and wacky). It would be more accurate to doodle what I eat, then it is to remember to go in and write down what I eat. Great finds!! That is too funny. Who gets paid to come up with this stuff? Wow! Hilarious! First off, I don't think doodling has EVER kept me from eating whatever I wanted! But good for them for attempting to distract me! The paper dolls and description are a HOOT! I love how our President is wearing white socks in his "pre clothing" look! Priceless! Thanks for the laugh! I'm your newest follower! I'm glad we haven't gone as far as Kevin07 commemorative plates.